Tucked away down a soi five minutes by foot from Jungceylon mall, Bodega’s location isn’t the best, but the cheerful atmosphere here more than makes up for it. This self-proclaimed “hotel-music café-gallery”, has a restaurant and bar on its main level with four-bed or eight-bed dorms and private rooms upstairs. The dorms have shared bathrooms with hot water showers, with the air-con switched on in the evenings and overnight only. With air-con, double bed, a TV, safe and ensuite bathroom, the private room is a reasonably priced alternative if you’re tired of the dorm scene. Bodega’s a great place to mingle with other travellers, with lounge seating and a balcony on the second level offering more space to gather beyond the restaurant. One of the cheapest places to be found in Patong, we had to make a few visits here before we were able to see the rooms, since the staff were busy with other guests and all the beds were full. As a refreshing change to the mass-market blandness that is blanketing Patong, the owners make an effort to liven up its interior and support local artists with original paintings on the walls. Rates include lockers, bed linens, towels and WiFi, though the signal isn’t great in the upstairs rooms. 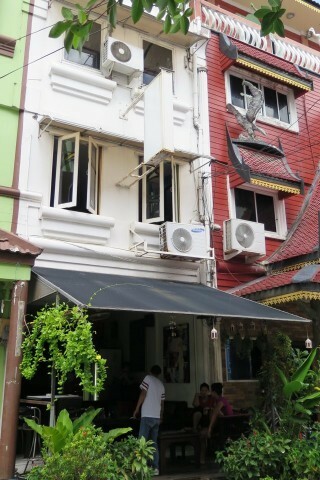 Room: Dorm air-con, low season: 250 baht, high season 400 baht. Notes: Eight-bed dorm.